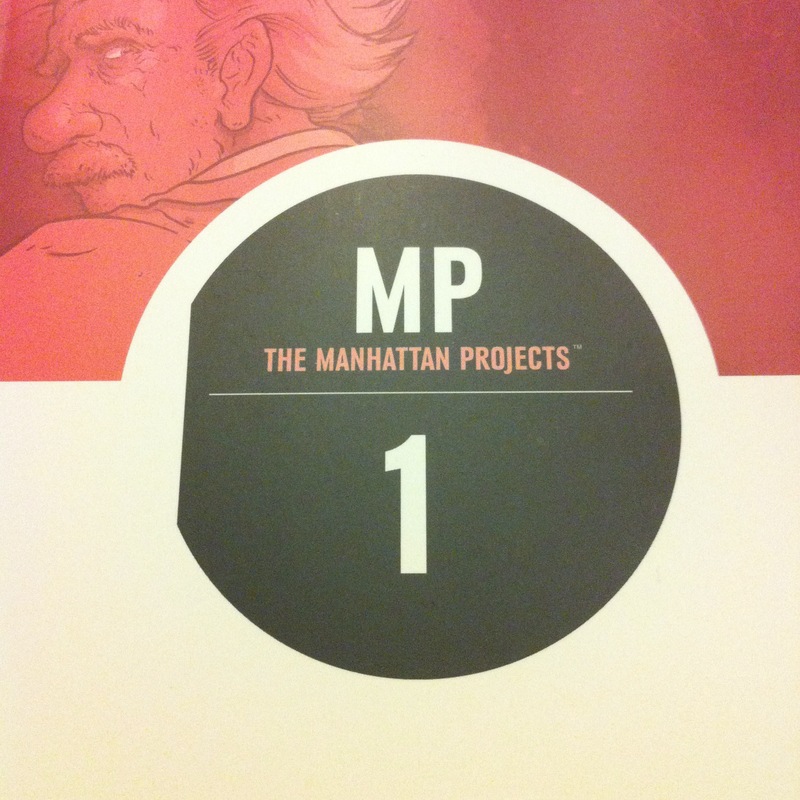 The Manhattan Projects Vol. 1 | Action Points! Do you love science? Do you love alternate history stories? Do you love fantastical science fiction? Do you love comic books? DO YOU? Well, have I got a book for you! Sit down as I tell you why The Manhattan Projects is one of the most amazing science fiction comic books on the market, and then stand up , go out and buy your own copy. Or remain seated and buy a copy on Comixology. Or send out a messenger pigeon. However you do it, you owe it to yourself to check this series out. The first trade paperback has just been released this month, and issue #6 has just hit the stands last week. Let’s start with what it’s about. 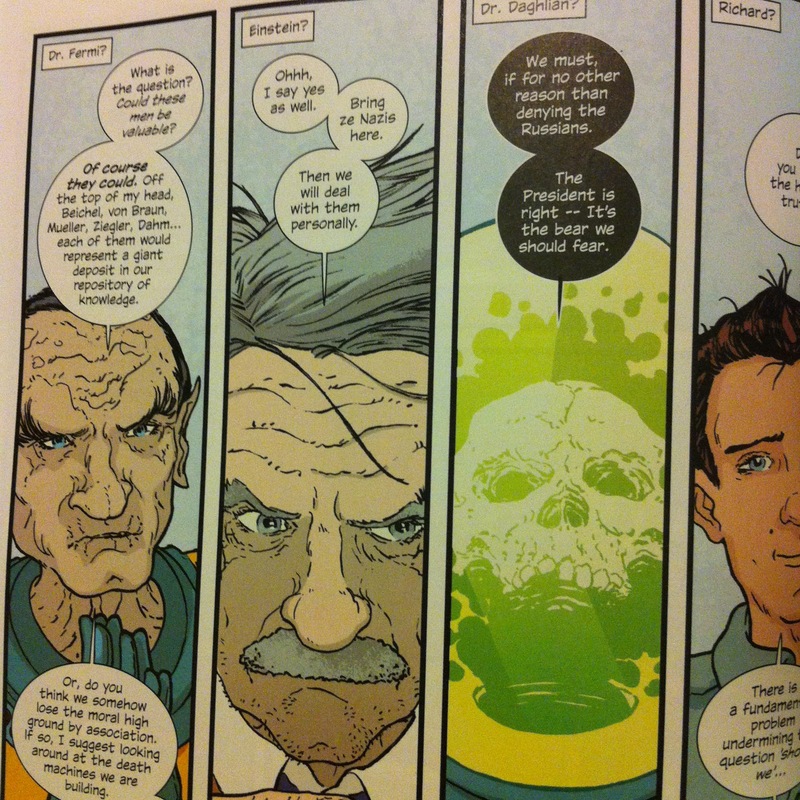 The Manhattan Projects postulates an alternate history where rather than just a single reseearch program into developing the first atomic bomb, the Manhattan Projects are actually a huge think-tank of the world’s greatest scientists working on more fantastical fields of study. The areas of study include recovery of mythological artifacts, alternate dimensions, building the world’s first artificial intelligence, alien technology, and much more. Admittedly, this is not something brand-spanking new and innovative, but it provides an interesting setting that tells you you have to be prepared for any and all weird sci-fi zapbonkery. It is very clearly set in a specific time frame, right at the end of World War II, and the theme of war and it’s service as an instigator for scientific research is present through the series. 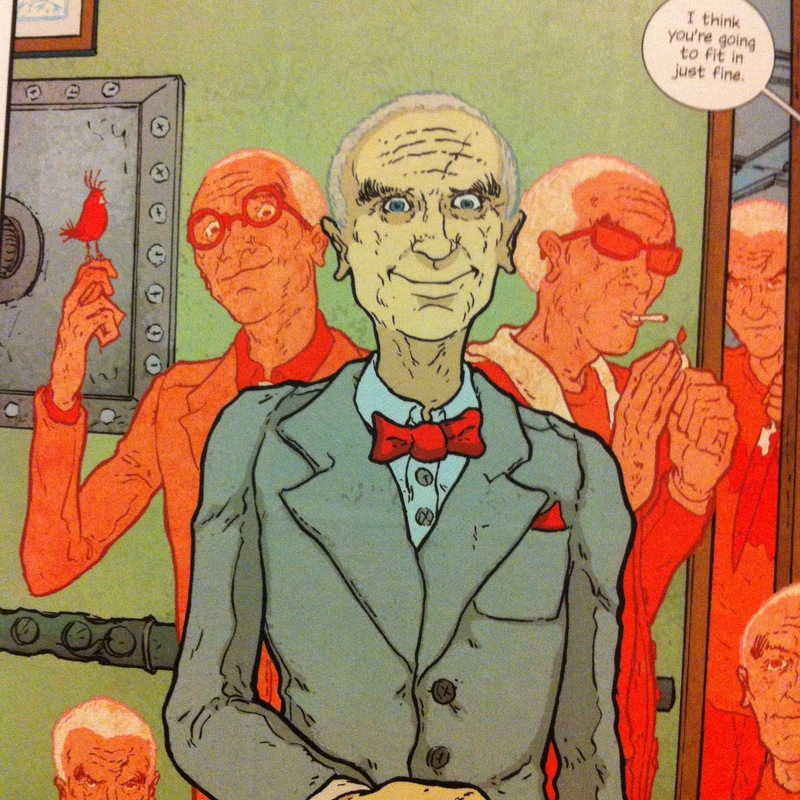 The first chapter of the story introduces us to the concept of the Manhattan Projects by focussing on its latest member: Robert Oppenheimer. ONly this isn’t the Robert Oppenheimer you know from the history books. No, this Robert Oppenheimer has a fictional twin brother, Joseph, who is a psychotic killer who consumes his victims. And fairly early on you find out there’s something terribly wrong with Oppenheimer… There’s a very good use of colour in the scenes describing the history of the twins, with Robert’s scenes in a blue hue and Joesph’s in red. The blue/red duality is a constant theme in this series, and is used to great effect. Other that Oppenheimer, the other main characters are all famous historical figures that were actually linked to the Manhattan Project with slight (HAH!) twists to differentiate from their real life counterparts. Albert Einstein is first glimpsed locked up in his own lab, examining a mysterious tablet. Wernher von Braun has a robot arm (An allusion to that one time he broke his left arm). Richard Feynman is portrayed as the wet behind the ears kid brother. Enrico Fermi is an alien (Not the boring kind. Y’know, the space kind). Harry Daghlian survived his irradiation in this universe and now has to live in a rad suit. Leslie Groves is still in charge of the Manhattan Projects and is kind of badass. FDR is preserved as an A.I. and Harry Truman is a crazy Freemason. Honestly, to me the plot takes second place to the very strong character development work going on in this series. The main pull for me is seeing how the characters interact and finding out why they act the way they do. There are plenty of flashbacks, which are usually coloured in the contrasting blue and red tones, making for a distinct visual indicator. The art is just gorgeous as well. The nuances on the faces of the characters are great and the style reminds me of some of Frank Quitely’s works. The colouring is also very strong and complements the art perfectly. As mentioned before, the blue/red pallete for the flashbacks are a trademark of the series. The design for the covers and the title pages are also fantastic. Simple, elegant and evocative. You can see that a lot of though has been put into making sure that each component of the book (writing, art, colours, design) complement each other and enhances the overall experience. You can tell I’m a big fan. It’s no surprise for those who know me, as I am often fond of alternate history tales. Atomic Robo is one of (if not my most) my favourite series, and it too is an alternate history/present setting. The two series actually share a lot of elements, which is why I love them: the attention to historic/scientific detail, the crazy liberties taken with “source material”, the strong character work and fascinating science fiction ideas. 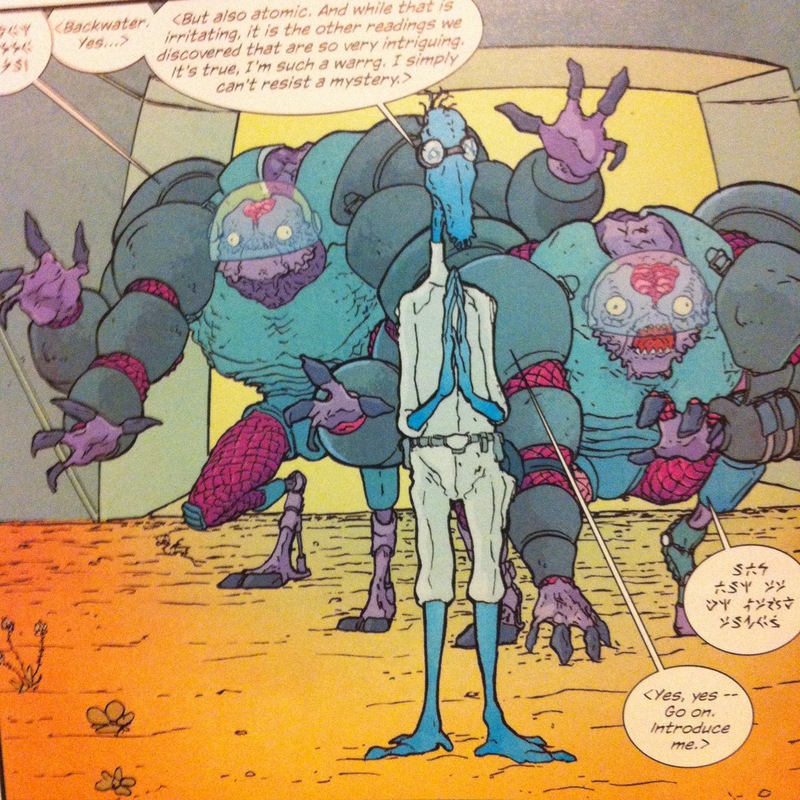 However, where Atomic Robo is more of a pulp-action story, the Manhattan Projects is more dark and brooding. There is a constant sense of foreboding and dread, with the feeling that there are forces at play beyond the understanding of the team, and some members of the team being bat-guano insane. Insanity levels might make it an acquired taste for some, and there is a fair bit of squicky violence. 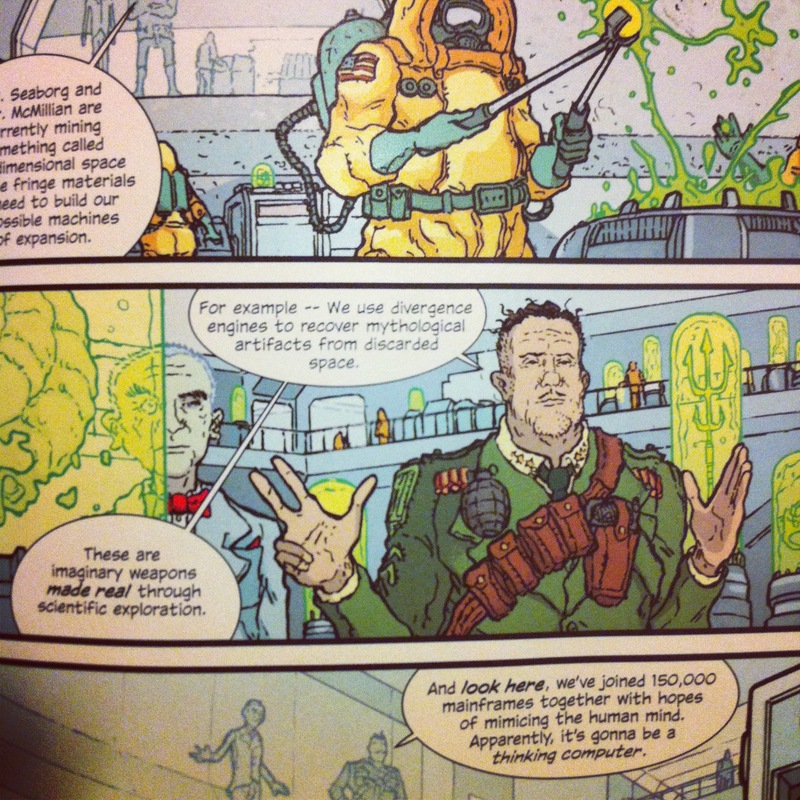 However, I think anyone who’s interested in a good character-driven science fiction story should check out The Manhattan Projects. 5 out of 5 Infinite Oppenheimers! Go out and grab a copy today.